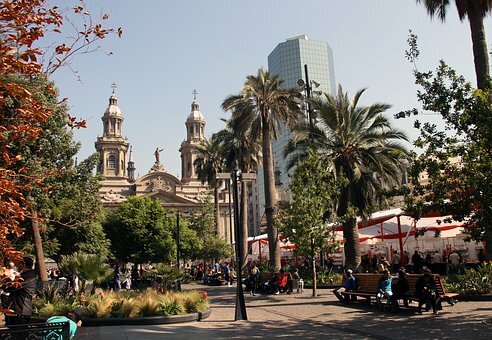 Witness the continued economic growth that has transformed this capital city into a financial, political, and cultural hub for Chile and South America. Home to more than five million people, Santiago is Chile’s industrial and financial center, and has a dynamic business sector, as well. Commute to work via the bus or metro, and step out for a lunch of caldillo de congrio (a traditional fish stew) or empanadas at the Mercado Central. An IES Internship develops your professional skills, your ability to communicate across cultures, and provides substantive work experience to jump-start your career in today’s competitive job market. The optional language class increases your Spanish language proficiency and fluency. You’ll be guaranteed* an unpaid internship placement at a local business or organization, where you’ll work for at least 32 hours a week. We will work with you to help find the closest match between your expressed preferences and professional goals with what’s available via IES Internships in Santiago. Before you go, we will work with you to fine-tune your résumé, perfect your cover letter, and hone your communication and interview skills as we prepare you for working in a new cultural environment. You will also enroll in a required 3- or 6-credit academic internship seminar with other IES Abroad interns, where you’ll learn about a variety of local business settings and opportunities. An optional 3-credit language course is also offered, the placement for which is determined by an online predeparture language test. With IES Abroad’s dedicated staff and international connections, you can be sure that you’ll find an internship that meets your goals. You’ll learn, and learn to stand out. Past students have interned in the fields listed below. Keep in mind that this list is by no means exhaustive. We encourage students of all majors to apply. Don’t see your field listed here? Just talk to your IES Internships Representative—new internships are always being added! After you are admitted, refer to the Travel Dates section of the Predeparture Information in your MyIESabroad account before booking travel. You may also enroll in an optional 3-credit Spanish language course taught at the Center. This is a list of planned course offerings. A final list of course offerings will be made available to you in your MyIESabroad account. We want to make sure that your greatest challenge is deciding which landmarks to see first or discovering the best café—not finding a place to live where you feel comfortable. We do our best to locate housing that is reflective of how the local students are living. Our goal is that when you leave Santiago, it will feel like home. Homestays - You live in a homestay in Santiago with a family or señora, who helps facilitate your language learning and integration into the Chilean community. Your homestay hosts provide two meals per day. The program begins with a mandatory orientation that introduces you to the IES Abroad Santiago staff, your fellow students, and the city of Santiago. Topics such as academics, housing, transportation, and health and safety are covered during this time. Students must be enrolled in a full-time degree program, or a graduate intending to begin their internship no more than 12 months after their graduation date (solid academic credentials related to studies or experience in desired field of placement required); graduate students enrolled in a full-time degree program may apply and will be reviewed on a case-by-case basis. Previous study of the Spanish language is not required; 4 or more semesters of college-level coursework, basic comprehension and conversational ability is strongly recommended for competitive placements. A passport that is valid for at least six months beyond the end date of the program, with at least two blank pages is required. U.S. citizens in possession of a valid passport do not need to obtain a visa to enter or study in Chile. Non-U.S. citizens may be required to obtain a student visa prior to arrival.